The HTC ThunderBolt, which went on sale March 17, is the first phone available in the United States that can connect to Verizon’s lightning-fast 4G LTE network. That fact alone makes the ThunderBolt ($250 with a new two-year contract) a considerable piece of hardware, especially for users who routinely run high-bandwidth apps such as video chat, online gaming, and high-definition video streaming. Network speed aside, I found the phone itself to be another solid addition to HTC’s mostly impressive family of smartphones, albeit one with a few shortcomings. The ThunderBolt definitely feels well built and sturdy in the hand. However, for someone coming from a smaller phone, the 5.78-ounce ThunderBolt, with its 4.8-by-2.6-by-0.52-inch frame, can feel like a monster in comparison. But the phone makes good use of its size. The ThunderBolt’s 4.3-inch WVGA screen gives you ample room to maneuver your fingers while touch-typing and navigating Websites when you’re on the go. My one complaint about the screen is that it is difficult to see outside under direct sunlight. The phone's design is quite simple, offering a power button and a headphone jack up top, a volume rocker on the right spine, and the standard Home, Menu, Back, and Search buttons on the face of the device. On the back are an 8-megapixel camera (with a dual-LED flash) and a kickstand, much as we saw on the HTC EVO 4G. You'll also find a 1.3-megapixel camera on the front of the device for video chatting (more on that farther down). The ThunderBolt’s main draw is its broadband speeds, which in my tests were simply stunning. Using the Ookla FCC Mobile Broadband Test, I saw consistent download speeds of between 8 megabits per second and 12 mbps. With full bars and in an area that supports Verizon’s 4G LTE network, I managed to load the PCWorld mobile site in about 4 seconds. Image-heavy sites such as Escapistmagazine.com loaded in under 10 seconds. The ThunderBolt can share its 4G connection with eight devices via its mobile hotspot function (though the service can cost extra depending on your plan). To test the limits of the 4G connection, I set up such a hotspot and connected an iPod Touch and another smartphone with it. I was able to stream live TV to the iPod Touch, as well as to download apps and watch high-quality YouTube videos on the phone, while at the same time browsing the Web and downloading apps on the ThunderBolt. All of these tasks ran quickly and smoothly over Verizon’s LTE service, and I got the feeling that I could have connected a few more devices to the hotspot with little performance loss. Call quality on the ThunderBolt was not crystal clear, but it was close. The people I called said they could hear minor wind noise from my end, but no other interference. The ThunderBolt comes preloaded with a new and improved version of Sense UI, HTC’s custom software that overlays the Android OS. Although most of the Sense UI improvements seem merely cosmetic, HTC has thrown in a few nifty new features as well. For instance, dragging down the notification bar at the top of the screen now reveals a list of previously opened apps. This extremely useful function may have been inspired by a similar feature in Apple’s iOS. Turning on the fast-boot option will allow you to start the phone almost immediately, though you will have to turn the function off to use certain Android Market apps. The '+' icon on the right side of the dock (at the bottom of the home screen) has been replaced with a brush and palette. Tapping it brings you to the personalization menu, where you can set the wallpaper, add items to the home screen, and change the sound settings. You can also change the skin of the Sense UI to one of the five available options. Unfortunately the ThunderBolt also comes loaded with too much unwanted software. Along with the Blockbuster app we saw on the Motorola Droid X, Verizon has loaded the ThunderBolt with a demo of Let’s Golf 2 and videos advertising Bitbop, Rhapsody, and Rock Band for Android. The usual Verizon suite of apps (Navigator, Slacker, V Cast Media, and the V Cast App Store) also makes an appearance. And guess what? You can’t remove these apps. This is not a major negative, but the extra apps do clutter up your app drawer, making it hard to quickly locate the app you want. The ThunderBolt features two cameras: a 1.3-megapixel camera on the front and an 8-megapixel one on the rear. Pictures that I took with the 8-megapixel camera came out well (click the thumbnails at left to see full-size images). The photos were surprisingly sharp. Even when I zoomed in, the resolution was reasonably good. Colors looked robust and true to the subject of my photos. Pictures taken in extremely low light were clear and easy to see, thanks in part to the dual-LED flash. The HTC EVO 4G also has an 8-megapixel camera on the back, but the ThunderBolt’s camera is clearly superior. The ThunderBolt’s front-facing 1.3-megapixel camera is another story; pictures that I took with it came out dark and a little murky. The front-facing camera is meant for video-chatting services, but I couldn’t find such an app that would work on the phone. Skype for Android does not yet support video chat, and Fring doesn’t recognize the camera at all. Qik could be another option, but it does not yet provide a video-calling app for the ThunderBolt. Although it’s nice to see more Android phones with front-facing cameras, without any software to use them they’re not much good. The video I shot with the phone was reasonably clear, but certainly not as clear as the still images I captured. When I shot a moving image, the video seemed a bit fuzzy; only when I held the camera still in front of an object did the sharpness of the video improve. A more serious problem relates to the audio: In video mode the phone records sound at such a low level that you have to turn the volume all the way up to hear it on playback, and even then you can hear only the loudest sounds. A DLNA (Digital Living Network Alliance)-certified device, the ThunderBolt can stream photos, music, and video to and from DLNA-supporting devices on your home wireless network. For instance, you can stream video to your DLNA-certified TV for playback. The music player can also stream from any media servers you have on your network. If you like to listen to your music on the go (as most people do), you’ll be quite happy to learn that the ThunderBolt ships with a 32GB MicroSD card on board so you can carry several thousand songs or movies with you. The HTC ThunderBolt looks, feels, and handles like a solid piece of hardware. 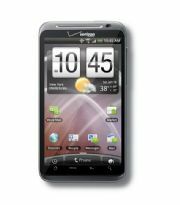 Although its specs aren’t anything we haven’t already seen in the Droid X or the Droid 2, the ThunderBolt’s ability to utilize the unprecedented speed of Verizon’s LTE network makes it a special phone indeed. Users who like to run high-bandwidth apps on the road--as in streaming high-def video or playing online games--will find no faster phone on the market right now.